Last week I attended the Scottish Philosophy and Psychiatry Interest Group in Stirling. The speakers were all excellent and I would like to share some of the learning and discussions. 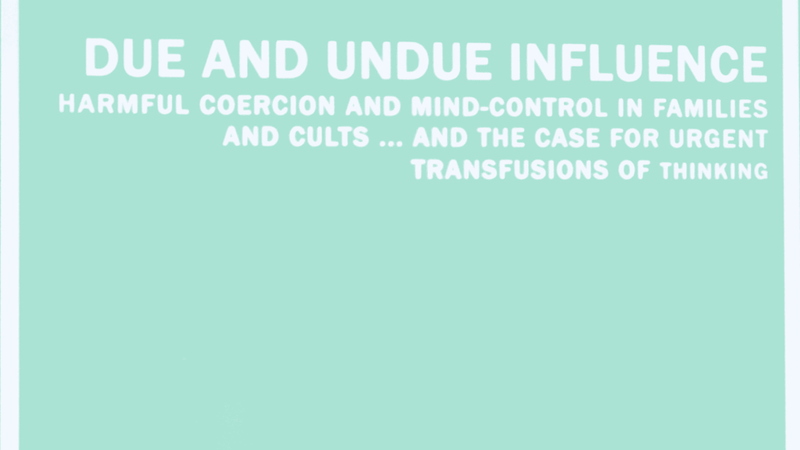 This was a fascinating talk which considered how we might tell if an influence is constructive or destructive. Nick guided us through some of the work of John MacMurray on the philosophy of personal relation. Nick went on to consider the role of attachment, alienation and the ‘influence continuum’. Nick illustrated his talk with several short films. Nick was keen to hear the views of the group regarding whether “improvement science” might have some of the features of cults? He asked the same question in relation to Alcoholics Anonymous. A wide range of views were then expressed which hopefully were, in some small group way, examples of “transfusions of thinking”. My presentation from November 2016 on Improvement Science can be accessed here. The next talk was by Dr Ewen Miller who presented on near death experiences. This was a truly fascinating talk illustrated with several case studies. The subject was the basis of Ewen’s PhD from Stirling University and the breadth of his knowledge revealed to us all that Ewen is a lad o’ pairts. After lunch, Dr David Crossely presented a most interesting talk based on the work of the the Canadian philosopher, Charles Taylor. David began by asking: “are we doing psychiatry without thinking about people philosophically?” David questioned whether the so-called, Bio-Psycho-Social model was sufficiently about people, asking where were the aspects of being such as agency and culture in this model? Taylor has put this in other ways, such as the need to consider “the whatness of who we are”. David went on to consider the current culture of measurement which is based on instrumental reasoning. After his talk this subject was considered further in group discussion, and it struck me that, in a safe space, we felt able to ask wider questions on what constitutes “evidence” and whether the current EBM approach, whilst necessary, can ever be sufficient. It was welcome also to hear David Crossely refer to the work of the philosopher Mary Midgley on subjects such as reductionism and self. Mary Midgely is now in her 98th year and her accessible philosophical considerations deserve to have a place in our collective approach to wellbeing. 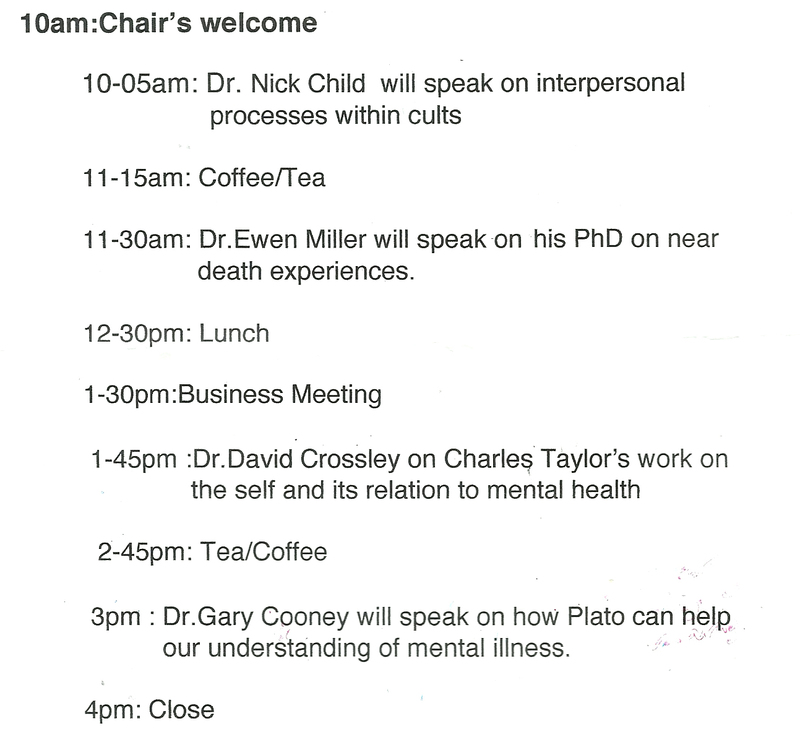 Our day ended with an eloquent and thoughtful presentation by Dr Gary Cooney on how Plato can help our understanding of mental ill health. Gary presented one slide that gave four pictures of different chairs and then asked “what makes a chair a chair”? He then showed a picture of a burning chair and asked “at what point is it no longer a chair?” I found this simple demonstration of how we name and determine an inanimate object quite powerful, particularly in a period where we are labeling more and more states of being by using single words. In summary, this small group meeting had all the aspects of the approaches taken by Patrick Geddes to learning: a group sharing experience and knowledge in a relaxed and open space which encouraged open thinking that could break free from establishment, institutional or corporate constraints. Thanks have to be given to Dr Iain Smith and Dr Tom Russ for organising these meetings. The death of Professor Eric Matthews last year has left us all at a loss; a more brilliant thinker and kinder man you are unlikely to meet. 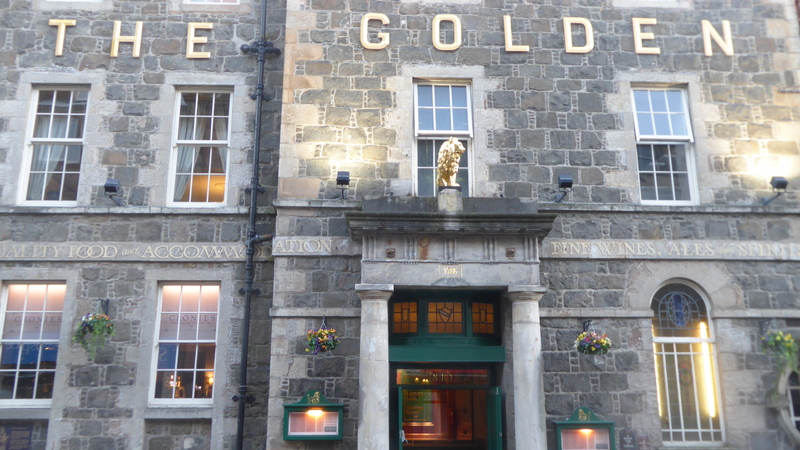 The last time I met Eric was in November 2016 here in the Golden Lion hotel. I was nervous about giving my talk on improvement science because I had come across so few critical perspectives on this subject. However Eric’s nods and affirmations and gentle but deeply thoughtful considerations put me at ease. We were glad then to hear from the Chair, Dr Iain Smith, that in December of this year there will be a special meeting to be held in honour of Eric Matthews.